Seventeenth century warfare was totally ignored by manufacturers until Revell produced this set of Imperial infantry as the first of four magnificent sets for the Thirty Years War. This is surely as good a set of infantry and anyone could ever hope for, and appeared when Revell were at the peak of their powers. The generous 16 poses include five poses with pike, seven with musket, two officers, a drummer and an ensign. So a full complement, and each figure is superb. The pikes are rather too short, being about 3.5 metres to scale rather than the five metres or more that regulations stipulated. 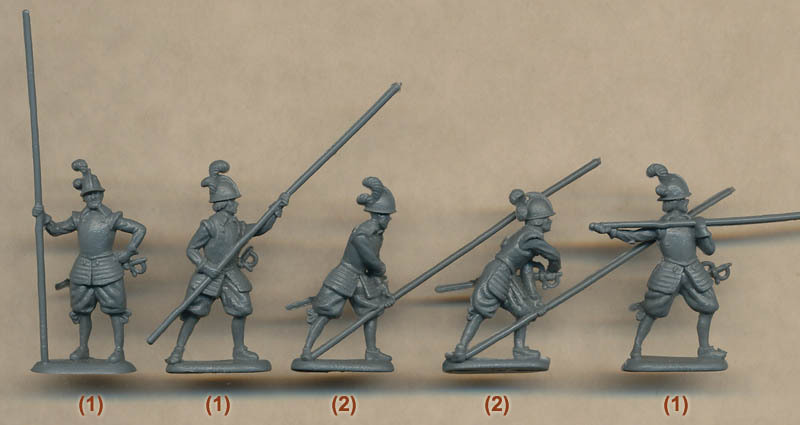 However, there are several accounts of pikemen shortening their pikes, much to the annoyance of their officers, to make them easier to handle, so perhaps these are a good length. However none of the pikes have a point. All the figures are well posed, with both pikemen and musketeers engaged in all the usual activities, including using the musket as a club. The armies of this war did not wear uniform as such, but these figures are accurately dressed and equipped. The detail is excellent and sharp, and there is virtually no flash. The ensign is particularly nicely posed, advancing while carrying his heavy load on his shoulder, but strangely Revell chose to engrave the Habsburg double-headed eagle on only one side of the colour. Put simply, this is a beautiful set. Some have complained that there were not two sets - one of pikemen and one of musketeers, as the proportions of each in an army varied considerably during the period. However that was never likely to happen with any of the big manufacturers, so what we have instead is one excellent set with figures that would work equally well in any of the opposing armies of the period, including the English Civil Wars.